Recently I’ve given some thought to what I have learned since coming out of college and landing my first job. With a looming birthday on the horizon and the ringing in of my late-twenties, I thought I would share what I’ve come up with so far. 1. You have to pay your dues: I remember coming out of college and thinking the world was my oyster because I had a degree. I quickly learned, like everyone else, I had to start somewhere and earn my stripes. 2. Your degree does not determine your career: Throughout my four years of college I was convinced I was going to go to law school and be a lawyer. Now, five years out, I have realized my political science degree is versatile and doesn’t lock me into one career track. 3. Try different jobs: I know everyone wants to show they have had a stable employment history on their resume, but I feel that your 20’s are the time to try different things and find your niche. 4. Practice patience: It takes time to get where you want to be, and it seldom happens overnight. Learn how to take everything in stride. 5. Network: Networking isn’t only important for landing your first job out of college. It’s helpful to engage in networking events throughout your career and maintain relationships with those contacts. 6. Find a mentor: I was fortunate to have mentors in college who guided me in terms of classes to take and career prospects. Having a mentor who can help you navigate your career choices is invaluable. 7. Embrace failure: Failure is your best friend. You learn from failures – how to handle them and bounce back. 8. Save for a rainy day: Learning to save from the time you have your very first “real” job will help you in the long run. Even if you can only afford to save $50 per paycheck, just getting in the habit of putting money away and having it for an emergency is a good strategy. 9. Start saving for retirement: I know this may sound strange and is probably not something you would think of when just starting out, but the earlier you start saving, the more time your money has to grow. If your company offers a matching contribution you are passing up free money if you do not take advantage of it. 10. Take care of yourself: Learn about nutrition and take care of your body. The earlier your start, the easier it will be to maintain a healthy lifestyle. 11. Learn new skills: Keeping up with new technology is vital in the workforce, but also for personal development. Taking classes at a community college, online, or through workshops is a great way to gain new skills and enhance your marketability. 12. Believe in yourself: If you don’t believe in yourself nobody else will, either. It’s okay to have moments of weakness and doubt, but learning to trust your gut (which comes with age) will help you in every aspect of life. Having a few good friends to give you a pep talk when you need it doesn’t hurt, either! 13. Know how to relax: It can be hard in your twenties (even overwhelming at times!) to figure out how to get where you want to go. This is where the patience part comes into play…. But knowing when you need to take a break and unplug is critical to mental clarity and future success. 14. Saying ‘No’: Ever say ‘yes’ to something that you really didn’t want to do? It’s better to just say ‘no’ up-front rather than to take on more than you can handle, or worse, something that your heart isn’t in to. 15. Have a soundingboard: This can be a friend, parent, or mentor, but having someone that you respect and will give you honest advice is a valuable asset. 16. Challenge yourself: Whether it’s conquering your fear of flying or learning a foreign language, it’s good to push yourself out of your comfort zone. 17. Take a solo trip: Traveling by yourself can be exciting and scary at first, but once you have a trip or two under your belt it’s a good feeling knowing that you can go wherever you want whenever. 18. Find a hobby: It can be a sport or blogging, but having something that you love to do is a great way to unwind and make new friends. 19. Keep looking for opportunities: With luck, you have found a great job and enjoy the work. Look for ways to take on more responsibilities in the organization or to get involved with larger projects. 20. Live in the moment: Your twenties are the time to find yourself and your niche. It’s a great time to focus on yourself. Enjoy the years – they go fast! 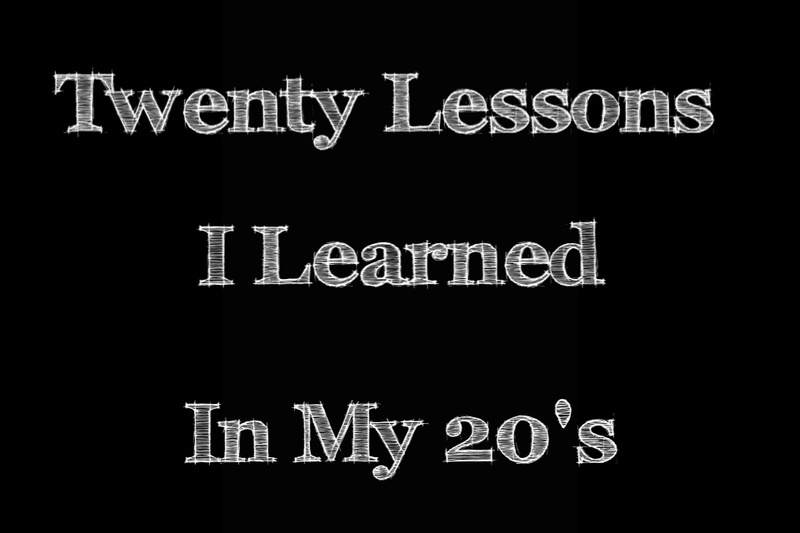 What advice do you have for someone in their twenties? Thank you very much Daisy! I’m so glad you enjoyed it. This is a great list. Lots of things to be learned in your 20’s. Some of these I am only just implementing now that I am nearing the end but better late then never. Thanks Kayleigh! I’m still working on some of these things myself!